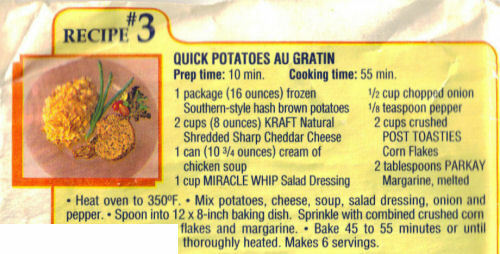 This recipe comes from a Miracle Whip label that was published in 1992 and found in a large collection. Recipe is typed below along with a scanned copy. Heat oven to 350°F. Mix potatoes, cheese, soup, salad dressing, onion and pepper. Spoon into 12×8-inch baking dish. Sprinkle with combined crushed corn flakes and margarine. Bake 45 to 55 minutes or until thoroughly heated. Makes 6 servings.